While Gretsch's American-produced drums remain expensive with a small but fanatical following, Gretsch's newer Asian-produced lines have been a revelation. The Modern Classic Maple is a pro Gretsch with a funky, retro-classic look and a price to compete with your Pearls and Yamahas. Retro chic combined with that great Gretsch sound. Competitive price. Only two finish options limits the appeal. Some aesthetic inconsistencies. The deep profile rims are a Gretsch trademark. The New Classic Maple: An alternative pro kit. Gretsch offers both wood and metal snares. The finish is Deep Cherry UV gloss. All the toms have six plies. Retro-classic look and a competitive price. Gretsch must be the only drum company to have produced an unchanging top line of drums for more than 50 years. Since its heyday in the '50s, Gretsch's drums have remained virtually unaltered. The charitable view is that there was no need to change them since they sounded so good. The more realistic view is that under-investment meant the company stood almost still while all around them modernised or sank. Gretsch always had a trump card, however - 'that great Gretsch sound'. The hardware was dire but the sound was to die for. So for decades, while pro drummers - jazzers and rockers alike - endorsed all kinds of drums on stage, many took a Gretsch into the studio. Gretsch continues to produce its top line Custom USA kits at a high price. But perhaps surprisingly, it's in the middle bracket that Gretsch has recently turned heads. The Catalina is one of the best budget kits around, and Gretsch has now come up with the New Classic Maple - an alternative pro kit, significantly cheaper than its American-made drums. The most striking visual change is in the double-post, low-mass tube lugs that replace the much-copied, curvy, die-cast lugs. The new lugs may seem a complete departure but the style goes back to the late '30s when Gretsch manufactured kits designed by Billy Gladstone. The next striking innovation is the ITS (Integrated Tension Lug Suspension System) for the small toms. It takes advantage of the double-post lugs by slotting in between each pair of posts for secure four-point stability. Unlike many other systems, Gretsch's ITS is sleek and barely noticeable, but still very strong. The down side is that in order to mount the ITS, there's an 'L' arm tom bracket, which in turn requires a multi-clamp attachment to a cymbal stand. All this is provided, but we can't help thinking that it is not the most elegant solution. One more nod in the vintage direction is the round brass badge, instead of the octagonal badge. Classic round badge Gretsch kits, particularly '50s and '60s kits, are the ones collectors go for. The new badge invokes the classic badge but bears the words: 'Gretsch New Classic Maple'. The shells are straight-sided with no reinforcement rings, and are made from a maple blend. The implication is that these are not the 100 percent Canadian rock maple of the more expensive USA kits. How much difference that makes is impossible to say, but they don't look any different. Where Gretsch shells differ from other shells is in the inner coating of matt silver paint and the 30º bearing edges. Most drums have clear sealed interiors and 45º edges. The 30º edges warm the sound slightly, bringing out a little extra depth. What's more, the thickness of each shell varies according to the shell's size. Therefore all the toms have six plies, but the 10" tom is 4.8mm thick, the 12" tom is 5.7mm and the 14" floor tom is 6.6mm. The 22" bass drum has eight plies and is 9.1mm thick. The effect this has on the sound is to maximise the performance of each drum. The small toms sing out with a rapid, sensitive response and the unbendable cast rims mean whether you tune high or low the pitch remains true. The thin shells give the drums depth of tone while the cast rims contain the sound more than triple flanged rims. The 14"x14" floor tom has body while the 22"x18" kick has a mighty thump. Fitted with an Evans EQ4 batter and uncut black logo front head, there is resonance aplenty, but excessive boom is controlled. As for finishes, there are only two available right now. 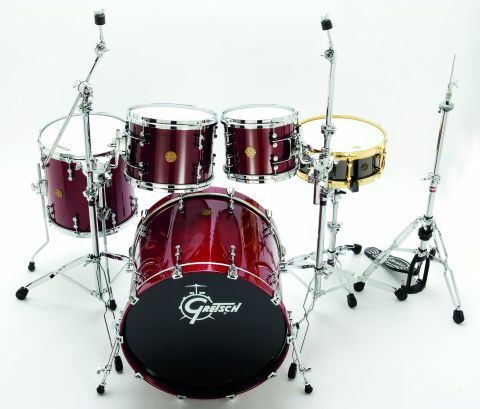 The review kit is Deep Cherry UV gloss, a familiar look to Gretsch fans. The alternative, Vintage Glass Nitron wrap, looks even better in the pictures on the company's website. The deep profile rims are a Gretsch trademark. Beautifully chromed, they really stand out because of their extra bulk. The two small toms continue another Gretsch tradition - five lugs per head. The floor tom has three monster legs and the leg mounting blocks have a correspondingly muscular, secure design. All the mounting hardware has black rubber gaskets for shell isolation. This includes the 10 streamlined bass drum hoop claws that have wrap-round rubber strips for full protection. Hardware was always a weak spot for Gretsch but things are really shaping up now. There are still design inconsistencies that, aesthetically speaking, don't seem quite right. The hardware does not quite achieve the completely unified look of the really big manufacturers yet, but what you do get now looks cool and, most importantly, it won't let you down. To complement the Classic look, Gretsch offers both wood and metal snares. The wood snares have 12-ply maple shells and side lever throw-off. Take a trip over to the Gretch Drums website for pictures. However, for the purposes of this review we were sent a limited edition Classic snare with a 1mm gauge 14"x5" seamless brass shell, plated in black nickel. This drum usually has chrome fittings but the review model has fittings and snare wires in contrasting gold. A 14"x6½" version is also available. The review drum also has a beautifully smooth Nickel Drumworks piston drive strainer. The heavy die-cast rims have eight lugs rather than 10 which opens the sound out a bit and makes tuning simple. The drum is suitably heavy and delivers a resoundingly musical clonk.